Gurumayi, in her talk on her Message for 2018—Satsang, taught about how the poet-saints of India made the experience of the Truth accessible to seekers by bringing them together in satsang. One of the most revered of these poet-saints is Tukaram Maharaj, who lived in Maharashtra, India, in the first half of the seventeenth century. During his short life, Tukaram made the experience of God’s presence accessible to multitudes. And over the centuries that followed, the poems and songs he left behind have continued to inspire and encourage unschooled villagers and educated scholars alike. On the Siddha Yoga path, we’ve come to know Tukaram mostly through the devotional songs (abhanga) by him that Gurumayi and Baba have sung during satsang and Shaktipat Intensives. These songs convey the experiences and teachings of a fully realized master, who, through his words, continues through the centuries to serve the Lord, whom he recognizes in the hearts of all. Through these songs in his native Marathi, the language of Maharashtra, Tukaram exhorts us to uplift ourselves by singing the names of God and by leading our lives in such a way that we, too, can attain liberation. This great Siddha invites us to experience the tiny Blue Pearl that contains the entire universe. He calls upon us to know for ourselves the bliss that permeates every particle of creation. In addition to these ecstatic and enlightening songs that our Siddha Yoga Gurus have quoted and sung, Tukaram wrote numerous other abhanga that are unfamiliar to most of us. These are the songs of Tukaram’s early life and sadhana, the ones that he wrote while searching for God in the midst of the harshest difficulties. As is true for many of India’s saints, the facts of Tukaram’s life have become intertwined with the village tales that accumulated over the centuries following his death. Fortunately, however, Tukaram himself recorded many of his experiences in his abhanga. The State of Maharashtra has published a collection of more than 4,600 of these, many of which have been translated into English and other languages. It is primarily from Tukaram’s own words that I have constructed the following narrative of his early life and sadhana. During the first years of my sadhana, reading some of the poems from the most stressful periods of Tukaram’s life strengthened my own resolve to stay the course, no matter what difficulties I was facing. I was encouraged to see how someone going through such intense struggles was not lamenting his fate but, instead, was still reaching for the Lord, calling out to the Lord, not for comfort but for strength. Even during those times when it seemed as if the Lord was not listening, Tukaram never turned his face away from the One to whom he was praying. And, as his later poems attest, his persistent effort bore wondrous fruit, not only for him but also for seekers throughout the centuries, including ourselves. Tukaram was born near the beginning of the seventeenth century in the small village of Dehu, which is in the southern part of Maharashtra, India. His ancestors and parents were dedicated Varkaris, a devotional religious movement in the Bhakti tradition that dates back to the thirteenth century and includes the great Maharashtrian poet-saints—Jnaneshvar, Namdev, Janabai, and Eknath, among numerous others. Varkaris are worshippers of Lord Vitthal (also known as Pandarinatha or Panduranga), a form of Lord Vishnu, the sustainer of the universe. Varkaris practice the understanding that God is everywhere and that everyone, regardless of caste or status, is worthy of the highest respect. Tukaram’s family, like most in their farming community, belonged to the Shudra caste, the lowest of the four castes in India at the time, consisting mostly of laborers. Tukaram’s father was, however, well-respected. He owned a good tract of farmland along the Indrayani River and made a decent income as a trader. As a young boy, Tukaram received a basic education and, unlike most of the other village children, he was taught to read and write. In the seventeenth century, it was customary for marriages to take place at a very young age, and when Tukaram was just thirteen, he was married to a girl named Rakhmabai. For several years, everything went well. Then, when Tukaram was seventeen, the life he knew began to come apart. His father became ill and died soon after. Around the same time, Tukaram’s elder brother, who had been groomed by their father to take over as head of the family, lost his wife. Overwhelmed by these losses, the brother abandoned worldly life, leaving home to become a wandering sadhu. This left Tukaram in charge of both the family and its business—roles for which he was totally unprepared. Though he worked day and night to keep things together, young Tuka began losing money. When he and his means were exhausted, some family friends came together and set him up again with a little money. Immediately after, however, the region was beset by two consecutive years of drought and a devastating famine. No crops grew, no cattle survived. Tukaram’s family, like hundreds of thousands of others, starved to death. He watched his mother die. He lost his eldest son. And his beloved young wife died, crying for bread. By the time Tukaram was twenty-one, he was over his head in debt and stricken by confusion, shame, and grief. His life was in ruins. It was then that Tukaram turned to the God his parents and ancestors had worshipped. to bathe in the river. he laid his hand on my head and gave me his blessings. Then he told me his own name—Baba ji. He gave me the mantra Rama Krishna Hari. in the bright half of the month of Magha. This day, which would have been in January or February by the Gregorian calendar, was truly momentous. By laying his hand on Tukaram’s head and imparting the sacred mantra Rama Krishna Hari , the sadguru who appeared to him in a dream—and whom he never saw again—had awakened Tukaram’s inner being and also launched him on the path he was destined to follow. Tukaram received this mantra the way a drowning person would take hold of a life raft. As he repeated Rama Krishna Hari over and over, the mantra, alive with his Guru’s grace, began to lead Tukaram out of the bleak inner landscape of darkness and confusion in which he’d been floundering. On Tukaram’s property, there was an ancient temple to Lord Vitthal that had long ago fallen into ruins. After repeating his mantra for some time, Tukaram felt called to restore this temple. This project made no sense to Tukaram’s second wife, Jijabai, who was convinced that her husband had lost his mind. However, Tukaram begged her to have patience, feeling he had no other choice. He was impelled to rebuild the temple, in service to God. As he worked on the temple, Tukaram conceived of the idea of performing kirtan there. A kirtan is a form of satsang that has persisted in Maharashtra since the time of Jnaneshvar, who was himself a famous kirtankar, a leader of kirtan, in the thirteenth century. The essential elements of a kirtan were the singing of abhanga dedicated to Lord Vitthal, with everyone joining in the refrains, and namasankirtana, a call-and-response chanting of the names of God, often while dancing in ecstasy. These sacred gatherings might also include the telling of inspirational stories from the Śrīmad-bhāgavataṁ, an ancient Hindu text that conveys the teachings of the Vedas through stories. Tukaram didn’t consider the poems he had written up to this point the right kind of material for a kirtan. For this reason, he began memorizing abhanga by Jnaneshvar and Namdev as well as the songs of Kabir. Once Tukaram had finished renovating and cleaning the temple, he began to conduct many kirtan in which he sang the songs he had learned and chanted the mantra his Guru had given him. And the villagers began to come. Soon thereafter, Tukaram had another dream, one in which Lord Vitthal appeared to him, accompanied by the saint Namdev. Namdev was one of the great Marathi kirtankar who had lived three centuries before Tukaram. In this dream, Namdev said that during his lifetime, he had vowed to write an enormous number of poems in praise of Vitthal—a number that was impossible for him to fulfill. Now, he had come with the Lord to ask Tukaram to help him fulfill this promise. After this dream, Tukaram began to experience abhanga rising, one after another, spontaneously from within himself. He did not feel that he was composing these songs but that the Lord himself was singing through him. Tukaram now had the courage to begin performing these inspired abhanga in the kirtan he conducted, and more and more people began to flock to the temple he had restored. Though he repeatedly insisted that he himself was not the author of these songs but merely the porter who was carrying them, the villagers attending the kirtan must have felt that Tukaram was simply being humble. They saw Tukaram as a saint within their midst. Tukaram meanwhile became even more painfully aware of his own lack of experience of the Lord, and because of this, his poems to Vitthal are often full of despair. People look upon me with honor and respect. They do not know what I am like inside. O Pandarinatha, I feel uneasy, ashamed to admit this. and do not see my faults. This went on for quite some time, as Tukaram continued to regard himself as imperfect and incomplete, full of defects and desires, and distant from the Lord. Though those who listened to him experienced divine energy pouring through him as he sang, afterward Tukaram would be in anguish, pleading with Lord Vitthal to grant him an experience of his presence. Tukaram continued to hold kirtan in service to Vitthal—leading people to sing the names of the Lord—and he continued to think of the Lord incessantly. In these ways, Tukaram was purifying his own mind. In time, he began to realize that even though he’d felt that Lord Vitthal was withholding his darshan, it was he, Tukaram himself, who had shut himself off from experiencing the Lord’s presence. His own feelings of shame and unworthiness, and his expectations of how Vitthal should manifest to him, had clouded Tukaram’s ability to recognize that the Lord had been with him all along. Although he’d had no visions of Vitthal, now he understood that surely it must have been the Lord who had summoned Baba ji Chaitanya to Tukaram for that initiation in his dream. It must have been the Lord who had impelled Tukaram to rebuild the temple and to hold kirtan there, and who came with Namdev in a dream to inspire Tukaram to sing his own abhanga. And indeed, it was the Lord who had been singing through Tukaram and uplifting the spirits of all who heard him. Sleeping, waking, and dreaming, I meditate on your form. I meet you in my mind. flows within me day and night. After having this recognition of God’s role in his life, Tukaram proceeded with greater confidence to offer his service to Lord Vitthal. More and more people were drawn to his kirtan, some coming from great distances to hear him sing his abhanga and to chant the names of God in his inspiring presence. At a time when the common people of Maharashtra were burdened by poverty and disease, by a rigid caste system and by economic exploitation, Tukaram was inspiring hope and courage among thousands. and am ready to embrace my destiny. I’ve laid a path for you across the ocean of this world. spiritual or worldly, idle or hard-working. Come! And don’t worry about anything. and you who long for liberation. with the seal of his approval. The orthodox Brahmins in Dehu began to regard Tukaram’s growing popularity as alarming. At this time, only those born into the Brahmin caste were authorized to teach spiritual truths, and they did so only in Sanskrit, the language of the Veda. For a low-caste Shudra to be inspiring thousands of common villagers with his songs about God in the common Marathi language was seen as an act of heresy as well as a serious threat to the Brahmins’ power. It was then that the one miracle story of Tukaram’s life occurred that he himself writes of in his own songs. The Brahmins demanded that Tukaram destroy his poems by throwing them into the Indrayani River. Tukaram followed this order, but as he watched his manuscripts sink into the water, he prayed to Lord Vitthal to protect them. Tukaram resolved to stay by the river, praying and fasting, hoping that if the poems were true, the Lord himself would save them. After thirteen days, townspeople saw Tukaram’s manuscripts floating on the surface of the Indrayani, intact and undamaged. After this miraculous event, Tukaram became widely known throughout India as a genuine saint in the tradition of the other great Varkaris before him. Great numbers of people traveled long distances to attend his kirtan, and some of the Brahmins who had persecuted Tukaram now became his disciples. Tukaram himself acknowledged this event in some of his abhanga. However, there are many other abhanga by him, the ones that Gurumayi and Baba have sung to us. These tell of an even greater miracle: the miracle of transformation that had been taking place in Tukaram’s being as he offered his service to Lord Vitthal. Tukaram’s long journey was now complete, his longing fulfilled. He had arrived at the recognition of his oneness with God. God is mine, and I am God’s. Utterly pure inside and out. Tukaram says, I am certainly blessed. 1 English rendering by Swami Vasudevananda © 2018 SYDA Foundation®. 5 English rendering © 1999 SYDA Foundation®. I see my reflection in Tukaram’s early life. His story reminds me that even in my current situation, I know that God is, in some miraculous way, supporting me and transforming me through this deeply trying period—even though it feels so hard! I am uplifted to hear that Tukaram felt the same way. And I especially appreciate that my hardships are bringing forth from me my deepest commitment to surrender to becoming unified with God, and to recognize that every moment is part of my sacred journey. I am grateful to have my Guru lighting the way, supporting and guiding me. I am very happy to learn more about the poet saint Tukaram, because I have heard his name often since my childhood but did not know much about his life. What stands out for me is how he moves from a state of confusion to a state of clarity, in part by renovating the temple dedicated to Vitthal, and by starting to conduct kirtan. I also noticed that it took him time to recognize all the ways in which he had experienced God. I can relate to these aspects of Tukaram's life since each time I have been in a state of confusion, grace has reached me—whether through my offering seva, through the Siddha Yoga path website, or through the Shaktipat Intensives—and helped me to come back to the practices, to come closer to my Self. 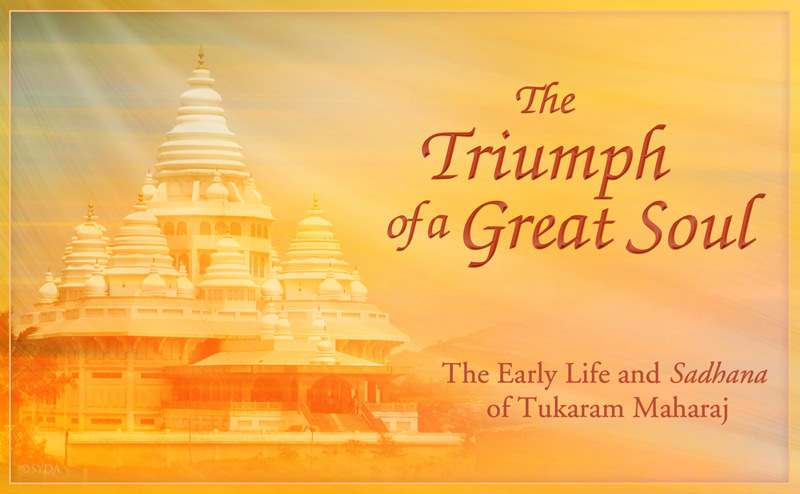 I am grateful to remember my own experiences of grace through this exposition on Tukaram. I see my reflection in Tukaram's early life. And like him, I know that God is in some miraculous way supporting and transforming me through my challenges! I recognize that these challenges are bringing forth my deepest commitment to surrender and become unified with God, and that every moment is a part of my sacred journey. I am grateful to Gurumayi for being my Guru and lighting the way with her guidance. As I read about Tukaram’s life, I thought about a friend who is facing many difficulties. I recalled the life stories of other saints who, like Tukaram, had to overcome hardship, and I encouraged my friend to read this story where I felt he could find hope. I am grateful for this lovely website that is a continued source of nourishment. I am grateful for this thoughtful, historical, and cultural exposition on the life of Tukaram Maharaj. I learned so much and felt even more. It reminded me of how precious and miraculous is my connection to the Siddha Yoga Gurus. I too "am certainly blessed." What a beautiful exposition! Another Siddha Yogi and I have satsang nearly every evening by phone. Tonight I read from this account of Tukaram's life, and we were both so inspired and moved by Tukaram's persistent devotion even as he was going through enormous loss and hardships. We both felt so grateful to know that though our lives have many challenges, we are not alone in walking this path to the Self. 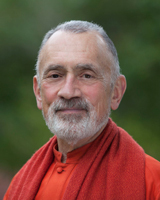 We have the company of the Siddhas, and they, too, had challenges. Hearing their stories fortifies our inner determination to keep going, to never give up, and reminds us to stay steadfast—we are almost there! I am thankful for this transformational gift of satsang. I was drawn to this exposition by the word triumph, and I finished the story feeling connected to my own resiliency and recognizing where and how triumph shows up in my life every day. Taking the time to reflect on Tukaram's story also brings perspective to what makes a life triumphant. Tukaram shows me that commitment and recommitment to navigating my challenges—with trust in God—builds strength, grows courage, and endows grace. I take refuge in the wisdom offered here and I am deeply grateful. Reading about Tukaram’s life also reinforced my understanding that attaining this state of mind takes time, and requires engaging steadfastly in the Siddha Yoga practices. I’m so grateful to have found the beautiful exposition on this great being on the website this morning. I received sweet inspiration and understanding of my own attitudes and challenges in my journey on this exalted path. I was fascinated and inspired by this exposition on the life of a great Siddha. I was especially moved by Tukaram’s realization that it was his own feelings of unworthiness that had shut him off from experiencing the Lord’s presence. Reading of his experience reminded me of a darshan I had with Gurumayi many years ago in which, without even speaking, she made me aware that I had created the same barrier within myself. This exposition was very timely for me. I have felt some of the same limitations that Tukaram shares, but this year’s Shaktipat Intensive truly inspired me and served as a turning point in my sadhana. I have a firm commitment to my goal of complete oneness with God. Oh, so beautiful! I am grateful for this wonder-full exposition on the great poet-saint, Tukaram! Reading about his life and hearing his enlightened words melted my heart into a flowing river of love. I am overflowing with gratitude for the Guru, this sacred path, and its amazing lineage. I was so moved by this exposition on Tukaram Maharaj. My heart melted with love for him, tears welled up, and I sang out loud: Rama Krishna Hari! His story makes me even more grateful to have received the experience of God from Gurumayi and Baba. How wonderful and inspiring it is to receive the nectar contained in the story of the poet saint Tukaram Maharaj. From his life story I have learned that it doesn’t matter how difficult life can become; the Lord always stays close to a true seeker, leading the way. After my morning meditation, I read this wonderful exposition. I felt Tukaram’s strength and love; his reward was the completion of his journey. This story is an inspiration for me: I want to end the journey; I want to come back home. “The Triumph of a Great Soul” touched me at a deep level from the moment I began reading it. Tukaram Maharaj suffered so much as a young man, and I wept for him and his family. I was excited when he found his path, following in the lineage of Jnaneshvar. I identified with his sense of unworthiness but then was inspired by his devotion, perseverance, and eventual liberation. He managed to live through all of his travails and transcend them without the guidance of a living Guru. How fortunate we are to have Gurumayi as our guide on this wonderful path. It is so good to read about Tukaram’s early life and his many struggles. I’ve come to see that the struggles I encounter are the doorway to the divine. So when something bad happens, I don’t have to panic. I understand that I will find the blessing in it. After reading this exposition, I will never think of Tukaram Maharaj in the same way. I now see him as one of us, as a seeker of the Truth. This exposition has also helped me to see the beauty and power of devotion in a deeper way. I loved reading about Tukaram, his humility and his awakening to the Lord. I was deeply touched by the difficulties in his life and also by his resolve to follow an inner calling to re-build the temple. This is a good reminder for me to always listen for the call of the Self, even when life is overly busy and complicated. This exposition is so beautiful and inspirational. It makes me want to chant even more. I feel that Gurumayi is with me in my own home when I am chanting. I love hearing about saints who sought God and became enlightened in the midst of darkness. I also have had a challenging life, but now I am breaking free as I truly give myself to the love and discipline of sadhana. I am learning to be strong and not give up on the practices. And I feel so much grace supporting me to go deeper in the practices. What a beautiful exposition about the sadhana of Tukaram Maharaj! During this year of Gurumayi's Message, Satsang, the simplicity and profundity of the songs of the poet-saints have sustained and comforted me through the challenges of everyday life. How blessed we are to be able to connect with the truth in this way. Today is my birthday, and as I read about the life of Tukaram Maharaj, I realized that birth doesn’t only occur once in your life. There are opportunities for rebirth, awakening to new possibilities, new hopes, a new life. I came to realize God’s presence in my life and in my heart later in life. As I read Tukaram’s story, I realized there is always an opportunity to achieve that state of oneness with God, no matter when you start on this path. Because my heart, like Tukaram’s, is open to the possibility of transformation, I am able to acknowledge the presence of God's love in my life. As I read this beautiful and true story, my heart was uplifted. In a state of prayer for the world, I listened to Tukaram’s words and heard his songs. Hope filled my mind and suffused my body. Seventeenth century or twenty-first century, the saints appear and never leave us. I am so grateful for this website where, in one click, I can be reminded of the Truth that each of us belongs to God—right now, in this moment, no matter what.